Park Lodge Guest House. Hull Bed and Breakfast. 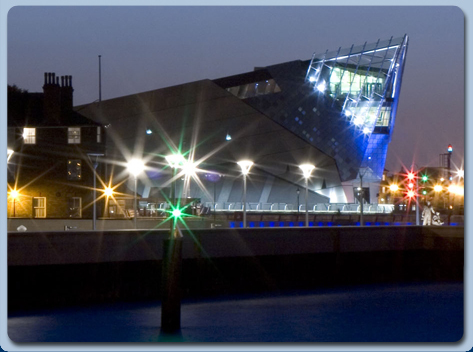 Hull and it's surrounding area have a huge selection of family and tourist attractions. Here are just a few that are available within a short distance from our premises. East Park is a Grade II listed park that recently benefited from a £10 million lottery grant. The park is right on our doorstep and regularly hosts many of Hull's most popular events such as the Veteran's weekend, The Hull Show and The Lord Mayor's Parade. The Deep is a public aquarium that is situated at Sammy's Point in Hull. Often refered to as 'The worlds only Submarium', The Deep is now regarded as one the most popular tourist destinations in our city and is also one of the most successful millennium projects in the Country. Both of Hull's Rugby League clubs boast impressive stadiums that have hosted numerous international sports events as well as their own domestic weekly fixtures. Both stadiums are just a short distance from our premises. Our city centre has received a national award from the Association of Town Centre Management (ATCM). Praising the quality of its nightlife, the Purple Flag status is in recognition of the safety, quality and diversity of our city centre. Web Design & Hosting by Evimo. Sitemap. Accessibility.